We currently have 543 used cars for sale in Manchester, Lancashire. 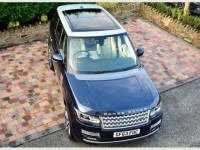 2013 (63) LAND ROVER RANGE ROVER 4.4 SDV8 AUTOBIOGRAPHY 5DR AUTOMATIC 5 Door Estate, Blue, 71,000 miles. 2013 (63) LAND ROVER RANGE ROVER 4.4 SDV8 AUTOBIOGRAPHY 5DR AUTOMATIC 5 Door Estate, Blue, 72,000 miles. 2013 (63) LAND ROVER RANGE ROVER 4.4 SDV8 AUTOBIOGRAPHY 5DR AUTOMATIC 5 Door Estate, Blue, 70,000 miles. 2007 (57) MASERATI GRANTURISMO 4.2 V8 2DR AUTOMATIC 2 Door Coupe, Blue, 39,000 miles. 2013 (63) JEEP WRANGLER 2.8 CRD OVERLAND 2DR AUTOMATIC 2 Door Convertible, White, Black Heated Leather, �3000 Extras, 47,000 miles, MOT'd until 23rd September, 2019.